Ex-Luton Town striker Andre Gray has completed his move to Hatters’ fiercest rivals Watford for a club record transfer fee. The 26-year-old has penned a five year deal at Vicarage Road after joining from fellow top flight side Burnley. 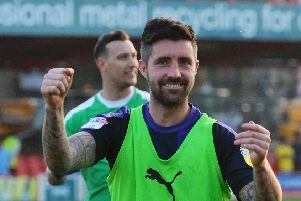 Gray found the net 33 times during two seasons with the Clarets, including nine goals in 26 Premier League appearances last term. The centre forward began his career with Shrewsbury, before joining Hinckley United and headed to Kenilworth Road in March 2012, going on to score 57 goals in 111 games, firing Luton back into the Football League. He left in a £600,000 move for Brentford in June 2014, before a £9m move to Burnley in August 2015. Earlier today, Luton chief executive Gary Sweet confirmed that the club wouldn’t receive a boost to their coffers from add-ons surrounding the fee.